We love to hear of any news about the island. If you have an item of news you would like to share with members, please contact us to give us details. The South Georgia Association is delighted to announce the award for the second year of its newly struck medal for 2019 to Mrs Sally Poncet, "For outstanding contributions to the study and conservation of wildlife and heritage of South Georgia". The medal was presented at the annual spring meeting of the Association in London. On the 6th February 2019 in Knightsbridge London, Bonhams are auctioning a number of Antarctic related items, including a sledge used on the British Antarctic Expedition 1907–09 and Ponting prints. The South Georgia Association is inviting nominations for the award of the Morag Husband Campbell medal for the second year. The Medal has been made possible by a generous bequest from a long-standing and enthusiastic supporter of the Association, Miss Morag Husband Campbell. It comprises a Sterling silver relief medallion, 60mm in diameter. The name of the recipient and the year will be inscribed on the reverse. It is intended to award the Medal every year or every other year depending upon nominations. The Association has agreed that the Medal should be awarded to individuals who have contributed significantly to the understanding, appreciation and promotion of South Georgia. This would encompass i) scientific studies as well as in the arts and humanities including culture, history, heritage, artistic endeavour etc., ii) adventurous travel and "exploration", iii) activities which enhance the wider appreciation of South Georgia (e.g. in the media or through administrative functions). Nominations (self-nominations are not permitted) should be made on the official Nomination Form also available from the Secretary of the Association, to whom they should be sent no later than 31st December 2018. The award will be made next year at the Annual General Meeting of the Association. The South Georgia Heritage Trust is organising an archaeological survey of the 19th century sealers' sites on South Georgia. Many visitors will be familiar with the three trypots at Elsehul or the cave in Fortuna Bay but there are over 25 known sites and more to be discovered. None have been properly studied and this needs to be done soon. Ironically, the fur seals and elephant seals which were almost wiped out by the sealers but they have recovered their numbers and their trampling is damaging or destroying many sites of archaeological interest. The plan is for a team of archaeologists from Cambridge University to spend three weeks in February and March 2019. They will be based on the Hans Hansson sailing to and from Stanley. We are looking for five 'citizen scientists' join - and help fund - our unique archaeological expedition to uncover the secrets of South Georgia’s 19th century sealing heritage. For more information download the brochure or see the project webpage. If you are interested, contact Bob Burton rwburton(at)ntlworld.com. The South Georgia Association is delighted to announce the award of its newly struck medal for 2018 to Mr Robert Wellesley Burton, "for outstanding contributions to the study and conservation of wildlife and the heritage of South Georgia". The medal was presented at the annual spring meeting of the Association in London. The BBC wildlife documentary series Blue Planet II featured footage of British Antarctic Survey (BAS) research on Wandering Albatrosses at Bird Island, South Georgia. New concerns were highlighted on the effects of plastic pollution in the oceans. This spectacular species is already seriously threatened by fisheries by-catch and a new BAS publication reveals populations of wandering, black-browed and grey-headed albatrosses have halved over the last 35 years. The South Georgia Association is inviting nominations for the award of its newly struck Morag Husband Campbell Medal. The Medal will be awarded to individuals who have contributed significantly to the understanding, appreciation and promotion of South Georgia. The South Georgia Association was deeply saddened to learn of the death of Henry Worsley whilst attempting a solo, unsupported crossing of the Antarctic Continent. Henry was making the crossing that Shackleton intended to make on his expedition on the Endurance. Shackleton himself died returning to further explore Antarctica, and is buried in South Georgia. There are obituaries in the Telegraph and the Independent amongst other sites. In 2011 when the South Georgia Heritage Trust started their multi-million pound rat eradication project, the South Georgia Association offered a bottle of champagne to the first person to find a South Georgia pipit nest on the Thatcher Peninsula. We're delighted to announce that it has now been claimed by Jamie Coleman, who found a nest in Burnet Cove, Maiviken, a few kilometres from Grytviken. This area was baited in 2011 at the beginning of the rat eradication project. Jamie estimates that there are now at least four pairs of pipits at Maiviken. It's fantastic to be seeing the results of the mammoth effort that went into the rat eradication project. The endemic South Georgia pipit that had disappeared from much of the island is making an amazing come-back: it is being seen and heard in places around the island where it has never been recorded before. We have submitted a response to The Government of South Georgia and the South Sandwich Islands' consultation on their strategy for the next five years, taking into account all the comments from members that we received. Our response covers many aspects of the Governance of South Georgia, encouraging responsible management of tourism, fisheries and the cultural heritage of the island amongst other topics. Please click on the thumbnail to view our response as a pdf file. The Government of South Georgia and the South Sandwich Islands (GSGSSI) have announced a consultation on their strategy for the period 2016 to 2020. All parties with an interest in South Georgia are invited to respond and contribute. The draft strategy document and a letter to interested parties are available on the GSGSSI website. Whilst members of the SGA are very welcome to respond to GSGSSI directly, we will also be submitting a response as an Association on behalf of our members. We would therefore welcome comments on the draft strategy which we will collate and incorporate in our response. Please send your comments and thoughts to secretary(at)southgeorgiaassociation.org by 5th July 2015. Adrian Fox, Head of Mapping at the British Antarctic Survey, will be giving a talk at the Defense Surveyors Association Annual Seminar on the 27th June. The talk will describe the evolution of mapping of South Georgia, from the earliest mapping efforts, through the expeditions of Duncan Carse in the 1950s into the interior of the island, to modern maps at detailed scales produced from satellite imagery to support the recent rat and reindeer eradication projects. Further details are on the Defense Surveyors Association website. The Shackleton Legacy meeting that we recently jointly held with SPRI was well attended and was a great success. The full programme of talks - on subjects as varied as Shackleton's leadership skills, sea ice conditions, navigation techniques, and expedition nutrition - remains online on our Shackleton Legacy page, with links to outlines of the speakers talks where they are available. Cambridge University Press are holding an exhibition at the Press Museum entitled The Greatest Treasure in the Library', telling the story of the two copies of the Encyclopedia Britannica that Ernest Shackleton took on his expedition to cross the Antarctic continent. The exhibition runs until the end of February 2015 and is open to the public, by appointment on Tuesday mornings between 10 am and 12 noon. Please contact archives(at)cambridge.org. Thies Matzen and Kicki Ericson have published a photo book documenting the two years they recently spent in the waters around South Georgia on their yacht, Wanderer III. Antarktische Wildnis: Südgeorgien is available with an English language insert from mare.de. Charles Swithenbank, who was president of the South Georgia Association for a number of years, died on the 27th May 2014, aged 87. Charles was an eminent glaciologist who was involved in polar research for most of his life, and was a staunch supporter of the Association. The Telegraph has published an obituary. This coming January, Albatross researcher Sally Poncet is leading a once-per-decade survey of the Wandering Albatross of South Georgia onboard the vessel Hans Hansson, as part of a collaboration between the Government of South Georgia, Golden Fleece Expeditions and Cheesemans’ Ecology Safaris. This expedition is open to participation by a few fortunate travelers, either to assist with the survey efforts or enjoy special access to rarely accessible sites on South Georgia. Sites include Albatross Island, the Willis Islands, and remote regions along the spectacular southwest coast under special permit. The expedition will travel for four weeks from Stanley, Falkland Islands during the peak breeding season for an estimated 18 landing days. There are further details on the Cheesemans website. Please contact Cheesemans directly if you are interested in going on the expedition. "The Maritime History of South Georgia"
Bob Burton has recently published a short book introducing the history of South Georgia from the perspective of the vessels that have sailed, and occasionally come to grief in, its stormy waters. The book is richly illustrated with photographs and includes a map of the island showing the sites of the many wrecks and hulks on the shores of the island. The book is published by the South Georgia Heritage Trust, and is available from their website. A Service of Thanksgiving for the life of Sir Rex Masterman Hunt, CMG (29 June 1926 - 11 November 2012) will be held at St Clement Danes, the Central Church of the Royal Air Force, Strand, London, WC2R 1DH on Tuesday 11 June 2013 at 2.30pm. Rex was the Commissioner for South Georgia and the South Sandwich Islands at the time of the Falklands war. Admission will be by ticket, which can be obtained from the Hon Secretary of the Falkland Islands Association. Applications should include the full names of those wishing to attend and a postal address for tickets, together with a note of their connection with Sir Rex. Applications can be sent by email to honsecfia(at)msn.com, or by post to 6 St Anne's Road, Shrewsbury, SY3 6AU. The closing date for tickets is Friday 31 May 2013. We're pleased to announce that the Association now has a Facebook page! If you are a Facebook user, do please visit us and contribute at facebook.com/southgeorgiaassociation. On 11th June 2013 South Georgia and the South Sandwich Islands will release a set of stamps to commemorate Rex Hunt, who was Governor of South Georgia at the time of the Falklands war. Rex Hunt died a few months ago, and a Memorial Service will be held on the same day at St Clement Danes church in London. First day covers of the stamps are available from the Pobjoy mint. They have offered lower rates to members of the Association. The Falkland Islands post office will also shortly be releasing stamps and coins commemorating Lady Thatcher, and the offer extends to cover these too. The habitat restoration project on South Georgia is proceeding well. Most of the reindeer have been turned into some exceedingly tasty venison, and spreading of rat bait by helicopter over large areas of the island appears so far to have been extremely succesful. The South Georgia Heritage trust has regular updates on the project on their newsletter page. The artist Karl Smith recently travelled to South Georgia on a Churchill fellowship to record the old whaling stations. He has being keeping a blog of his travels to showcase the resulting paintings, which are inspired as much by the striking natural landscape as by the industrial heritage of the ruined stations. Karl hopes to put on an exhibition of paintings in due course, to which members of the SGA will be welcomed. 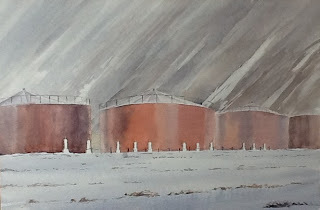 In the meantime, you can view many of the paintings on his blog at www.southernoceans.blogspot.com. Henry Worsley will be giving a lecture at the Royal Geographical Society on 23rd April about his two polar journeys. The lecture is a personal reflection using diary entries, photographs and original film footage from Scott, Shackleton and Amundsen. The lecture is in aid of the Shackleton Foundation, and there are further details on their website. Tickets cost £20. "Troubled Waters: trailing the albatross, an artist's journey"
After living with wandering, black-browed and grey-headed albatrosses thirty five years ago on Bird Island and South Georgia in the remote Southern Ocean, Bruce Pearson returned recently to see what had happened to some of the birds he had known so well. Troubled Waters: trailing the albatross, an artist's journey is the resulting book. Bruce worked with BirdLife International to gain extraordinary access to the work of the Albatross Task Force, last year joining the crew of a longline fishing boat, and a trawler, off the coast of South Africa. Troubled Waters is a unique collaboration between art and conservation, transforming a personal passion for albatrosses into a thought-provoking personal story, and portfolio of work, that brings to life the open ocean and which responds to an urgent contemporary conservation issue. For more information please visit www.brucepearson.net. There will be an exhibition of Bruce's work at Art Galleries Europe, 18 Maddox St, London, W1S 1PL from 26 November - 1 December 2012 (10am - 5.30pm daily). Rowan Huntley has extended an invitation to SGA members for a private viewing of her new exhibition "Alps to Antarctica". at the Alpine Club, 55 Charlotte Road, London EC2A 3QF. The exhibition features paintings and studies of South Georgia amongst other Alpine and Polar scenes. The private viewing will be held on the 9th October from 5 to 7pm. The exhibition is then open until Christmas - further details can be obtained from the Alpine club on 020 7613 0755. The invitation is available to download here. Members of the association are invited to attend an event at Discovery Point in Dundee on the 24th November. A presentation of artefacts used by Dr. Reginald Koettlitz on the 1901 - 04 Discovery Expedition will be made by Ann Koettlitz, great-niece of Dr. Koettlitz. This will be followed by the announcement of a major new book, Scott's Forgotten Surgeon, Dr. Reginald Koettlitz, polar explorer by Gus Jones. The invitation is available to download. Members of the association recently celebrated our 10th Anniversary in style, with a dinner at the Royal Overseas League in London. Paintings and a photo competition brought back memories of the island for many, and we were entertained by the folk singer Cliff Wedgbury, who performed a number of his Antarctic ballads - including a new song written especially for the occasion. If you weren't able to come along in person, you might like to read David Tatham's speech looking back at the achievements of the association over the last 10 years. Alec Trendall, who served as a geologist with the South Georgia Surveys of 1951-52 and 1953-54, has recently published 'Putting South Georgia on the map' - an account of the surveys that Duncan Carse organised to produce the first accurate map of the island. The 216-page book has a large format and uses photo-quality paper throughout, so that the many photos tell the story in parallel with the text. Coloured maps, redrawn from the 1:200,000 map that resulted from Carse's expeditions, show the routes travelled. The book is available to purchase at the author's web site. The South Georgia Heritage Trust is accepting applications for the new position of Director, South Georgia. The director will look after the SGHT staff on South Georgia and manage the South Georgia Museum from October to March each year, living and working on South Georgia for this period. The appointment for this role will be made prior to the 2011-12 season which begins in October 2011. Applications need to be submitted by 12th of August 2011. To download the job description and find out how to apply, please visit the South Georgia Heritage Trust website. The first phase of the habitat restoration project on South Georgia appears to have been successful, with no reported sightings of rats in the Grytviken area since bait was spread by helicopter in the summer. Larger areas of the island will be cleared of rats over the next couple of years, and removal of the reindeer population is also planned. Removing the introduced species will allow the native species to flourish on the island. The latest news on the Habitat Restoration Project is available on the South Georgia Heritage Trust website. The Government of South Georgia and the South Sandwich Islands have begun a public consulation on a new Wildlife and Protected Areas bill for South Georgia. Details of the revised legislation are available on the South Georgia Government website. The South Georgia Association will be responding to the proposals. If you would like to ensure your views are taken into account, you are welcome to contact us directly - or why not make your views known on the new legislation thread on the SGA forum! Signing up is easy, and we'd welcome discussion from members and others with an interest in South Georgia. The South Georgia Government have given the go-ahead to the South Georgia Heritage Trust's plan to eradicate rats from South Georgia. Brown rats were introduced to South Georgia by sealers and whalers and now occupy the entire north-eatern coast of the island and the southern coast at the north-west end. Mice are also present in some areas of the island. Rats predate on ground nesting birds such as the South Georgia pipit and small petrels and the South Georgia pipit is absent from all rat infested areas. The eradication of rodents from South Georgia was identified as a high priority in the GSGSSI Plan for Progress. Over the last five years the South Georgia Heritage Trust have been developing plans and raising funds to undertake the eradication. The presence of glaciers on South Georgia, which isolate sections of the island, means that the eradication can be undertaken in stages. However the rapid retreat of many of the glaciers increases the urgency of undertaking an eradication programme. More details can be found on the Government website. You are also welcome to read the SGA response to the proposals. Three sturdy wooden benches commissioned by the SGA have been handed over to the island to let weary visitors (and residents!) rest and relax while taking in the stunning scenery and wildlife. The benches were skillfully hand-built by Thies Matzen, who has been living on South Georgia for the last few months on his historic yacht, Wanderer III. Thies constructed the benches in the museum workshop. The benches are very solidly built to withstand the worst of South Georgia weather. We'd like to extend our grateful thanks to Thies for the hours he has spent in building the benches, and to the South Georgia Museum for offering to look after the benches for us. We're sure they will be appreciated by many over the coming years! The 8th AGM of the Association was held at the Royal Overseas League, London, on the 29th May. As well as committee reports, we heard messages from the South Georgia Heritage Trust, Oyas Venner, Howard Pearce (until recently the commissioner of SGSSI), and government officers. Professor Nick Owens, director of the British Antarctic Survey, gave a talk on the scientific work the Survey is undertaking around South Georgia. Professor David Drewry was elected chair of the Association at the meeting. David has been Vice-Chancellor of the University of Hull since 1999. He was educated at the University of London (Queen Mary College) and holds a Doctorate in Geophysics from Cambridge University, Emmanuel College (where he is Honorary Fellow). He was previously Director-General of the British Council (1998-99), Deputy Chief Executive at the Natural Environment Research Council (NERC)(1994-97), Director of the British Antarctic Survey(1987-94), and Director of the Scott Polar Research Institute, University of Cambridge (1983-87). David will be taking up the post in January. David Tatham will continue as acting chairman in the meantime. In the 9th June episode of 'Making History', presenter Vanessa Collingridge talks about life on South Georgia with one of the few surviving members of the British whaling fleet. More details can be found on the 'Making History' website. If you missed the broadcast, you can listen to the programme via the BBC i-Player. The Association recently purchased and donated to the South Georgia Museum a watercolour of Grytviken that was found by a member in a Car Boot Sale. We believe that it was painted during Governor Hodson's visit to the islands in 1928, details of which were published in a recent Falkland Islands Journal. The Artist is unknown and any suggestions are most welcome.